According to the “Simplifying the Future of Work Study,” a survey conducted by Knowledge@Wharton and SAP, fighting complexity has become a strategic corporate imperative. You can find a link to the whitepaper which details the responses and the results here. How does complexity creep into every aspect of our lives and what can we do about it? In my opinion, every landscape (including IT landscape, process landscape, political landscape, personal landscape) is just like a garden. If we want to keep our gardens clean and well looked after, we need to spend time by working on the landscape and be intentional about what we plant, what we allow to grow and what do we prune and how often we do this. It is much easier to prune and keep your landscape simple and beautiful if you spend a little time everyday deciding and acting on what you want to prune and what you want to grow. As in everything else in life it is simple things like this that we fail to do and end up with a garden full of weeds, which then make it difficult for the really important things to thrive. At the INDUS Conclave, we have a set of INDUS members who will share their journey of how they have fought complexity and simplified their landscapes, processes, decision making capability and much more. You can find more information about the conclave here. 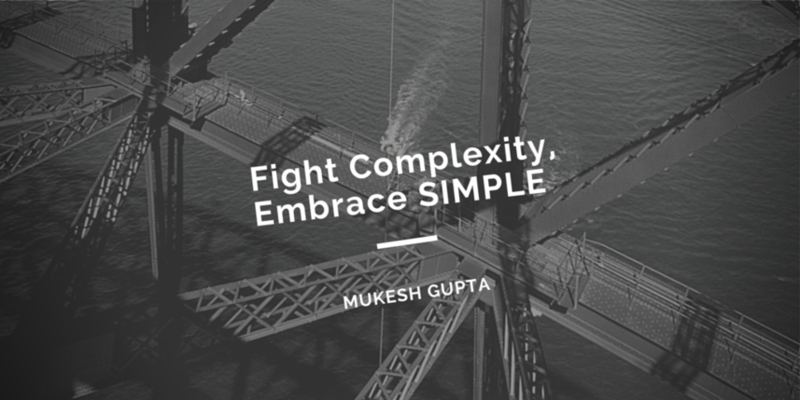 Join us on 15th April at NSCI Stadium, Mumbai, to not only learn from these folks but also to celebrate their journey of fighting complexity and embracing simple. What do you think is too complex and needs to be simplified? Share your thoughts on Facebook, Twitter, LinkedIn or any other medium with the tag #Simplify #INDUSConclave.